The Nissin Zerosum Oni Honryu 450 is the first Japanese rod designed by a Japanese angler for American waters and American fish (more on that later). It is a premium big water, big fish tenkara rod. There are other honryu rods to be sure. The Nissin Air Stage Fujiryu Honryu 450 and the Daiwa Expert LT H44 come to mind. The Nissin Zerosum Oni Honryu 450 is different, though. Although it is a big rod, it has a feel when casting that is reminiscent of the other Oni rods. You can feel the Oni touch. I find it very interesting to contrast this rod with the Nissin Air Stage Fujiryu Honryu 450. Casting the two rods side by side, you can get a sense of the difference in the designers' casting strokes. The two rods have virtually identical penny ratings, with Oni's rod at 20 pennies and Fuji's rod at 20.5. John Vetterli of the Tenkara Guides in Salt Lake City, who has fished with both masters on the same trip to Japan, describes Fuji-san's cast as slow and very smooth, as if he wants the rod to do all the work. Oni's cast is much quicker, and there is an acceleration in the forward stroke that applies power at just the right moment. I have not fished the Nissin Zerosum Oni Honryu 450 in a wide variety of conditions with a wide variety of lines. The first line I tried with it was a size 3 Sunline about the length of the rod. It cast it as if that is the line it was designed for. I then tried a Fujino Soft Tenkara Long Type 7 meter line. It cast it as if that is the line it was designed for. I didn't try one of the Nissin PALS SP Pro lines, but from feeling the power of the rod when making the cast, I am confident that it would cast it as if that is the line it was designed for. Notice a pattern? I think this rod will cast whatever line you put on it. Rob Worthing, also of the Tenkara Guides, told me that with the Oni Honryu 450 he was casting a Fujino Soft Tenkara Long Type 10 meter line into the wind, and that the rod/line combination gave him a whole new understanding of the mechanics of casting. I have always thought that a nylon line was fine as long as it was a dead calm day (or if you were casting downwind). To cast a 10 meter nylon line into the wind is an achievement. I don't think that is something you could do with the Air Stage Fujiryu Honryu 450. There is a much bigger contrast between the Nissin Zerosum Oni Honryu 450 and the Daiwa Expert LT H44. The Daiwa is a 35 penny rod - much, much stiffer than the Oni honryu. The first time I fished an Enshou LT44SF (the very similar predecessor of the LT H44) I didn't like it, and it wasn't until I tried it on a big lake in Maine with a heavy line and a big heavy bass fly that I finally got an appreciation for the rod. In contrast, I liked the Oni Honryu from the first cast. My first thought was that the superlatives were justified. Dave N with his Patagonia brown. I haven't caught any big fish with the rod yet. John Vetterli has caught a couple 20 inchers with it and said they didn't max out the rod. David Noll took one to Patagonia and had no problem with the big browns there. One of the things that did surprise me about the rod was that it is rated for 3X tippet, which is stronger than the manufacturer's recommendation for any other tenkara rod that I know. I would bet that this rod will handle any trout you ever hook. If you've been looking for a big water / big fish tenkara rod that will cast any line you put on it (into the wind if need be) this might just be the rod you have been waiting for. Coming back to the first point about this being the first Japanese rod designed for American waters and American fish (not counting the TenkaraBum 36, of course), I suspect Tenkara no Oni was thinking only about trout and only about mountain streams, like the Provo River in Utah, on which the Oni School is held. Well, as I keep having to remind our Japanese friends, we have fish other than trout and waters other than mountain streams. I just got a note from a very satisfied buyer. He wrote that when fishing panfish poppers, the Zerosum Oni Honryu 450 is much better than a western fly rod at "the actual popping of the popper. I can sing them like a symphony. Love my new rod, it's all I dreamed a popper rod could be." Although the rod was designed with American fish in mind, it pretty clearly was not designed with American postal regulations in mind. The rod is just barely too long to qualify for First Class International shipping rates. That doesn't affect Americans, but a buyer in Australia for example would face a shipping charge of $50 compared to only $10 if the rod had been just a little bit shorter when collapsed. All international shipments will require additional postage. Please request a qoute before ordering (applies to both the 395 and the 450). I have not fished the Oni Honryu 395, but Dave N has one and writes "I use my 395 almost exclusively nowadays. 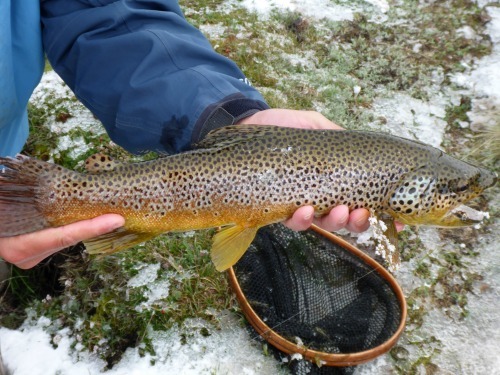 It works great in the Driftless and had no trouble with large fish in Patagonia. Smaller fish will give it a bend and so far large fish have not been a problem. 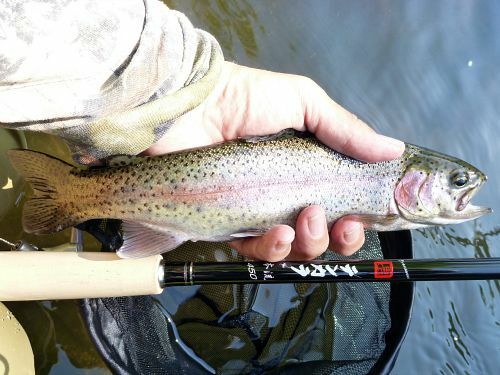 Great rods that are really easy to cast with." 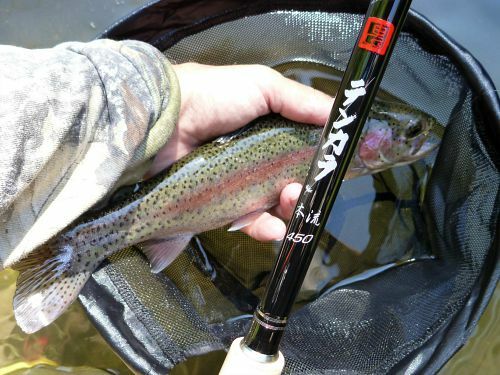 It is also one of the rods recommended by the Tenkara Guides for use in the Oni School, held on the Provo River in Utah. The Oni Honryu 395 is a very capable rod that is intended for waters that are just a bit too small for the 450. Man I love the Oni Honryu 450. The construction and action are extraordinary!